The early years of Zenas Baptist Church now lie in virtual obscurity. Not much is known of those first pioneers as records have been lost or destroyed. Nevertheless, a little information has been uncovered and presents itself a proud retelling. The town of Zenas itself must first be discussed. According to deeds recovered at the Jennings County Courthouse, the land on which the town of Zenas stands was obtained from the government of the United States by Stephen Beard in August, 1821. Mr. Beard soon sold this land to William Elliott on Christmas Eve, 1824. He then sold the land to David Elliott in February of 1829, his "heirs executor." This is collaborated by a deed dated the twenty-fifth of May, 1843, in which the trustees of Zenas Baptist Church purchased lot number fourteen from David Elliott for the sum of ten dollars. This corresponds now to the ground owned by Wayne and Wanda Lee Martin where the church sat just north of present residents Cal and Mary Criswell. It is David Elliott who is given the credit for platting Zenas in 1837. Zenas was once a booming town as both materials and old-timers will verify (see History of Jennings County, Indiana, compiled by Mrs. Helen Ledand, Mrs. Diana Goldberg, Miss Rosemary Calli, and Mrs. Ruth Besel, 1956, rpt. 1979). It once contained a tanning yard, wagon factory, grist mill, two stores, two blacksmiths shops, and a cooper shop (perhaps not all at the same time). It even had a tavern and saloon! There were many shoemakers about and lumbering was the chief industry. This, of course, soon gave way to agriculture. The Zenas Telephone Company was established in 1903 until taken over by Greensburg Telephone Company was established early on in the mid 1800's and discontinued in 1910 when the rural route was established. Early storekeepers were Mr. Cooper, Mr. King, Myers, Grinsted, Thomas Woods, and Galloway and Brogan. Zenas also had a few doctors and lawyers. It is said that Zenas takes its name from the Biblical character Zenas the lawyer of Titus 3:13. Early doctors were Dr. Corya, Dr. Love, Dr. McFarlan, and Dr. D.W. Case. As for eduction, a school was erected in Zenas in the 1830's. A high school was added later, about 1900. All of the above information may be found in History of Jennings County, Indiana, referred to earlier, and in Township Histories of Jennings County, sponsored by the Muscatatuck Chapter of the Daughter's of the American Revolution. Marvin Baldwin was the contributor for Columbia Township in the latter collection. Both are available at Jennings County Public Library. As for the Church of Zenas itself, an entry in the minutes of Hopewell Baptist Church in July 1843 indicates "...We agree to send Helps to Zenas for the purpose of examining certain members and if expedient to constitute them a church, the following members were sent: Bro. Tucker, Bro. Davis, Bro Gar. Bowswell, Bro. Ferato, Bro. Jas Harrel...." This happy situation may have been brought about by an earlier business meeting at Hopewell (September 1842) where "...The church agrees that Brethern B. Tucker and A. Baker shall open a door for the reception of members at Zenas & receive members for Hopewell Church." Evidently, the preaching of the Gospel at Zenas by these pioneer preachers (this is the reference "open a door") created a small band of believers. Rather than merely absorb these individuals, Hopewell made the wise decision to aid in the constitution of a separate church at Zenas. Zenas and Hopewell have always been sister churches maintaining a good relationship ever since. 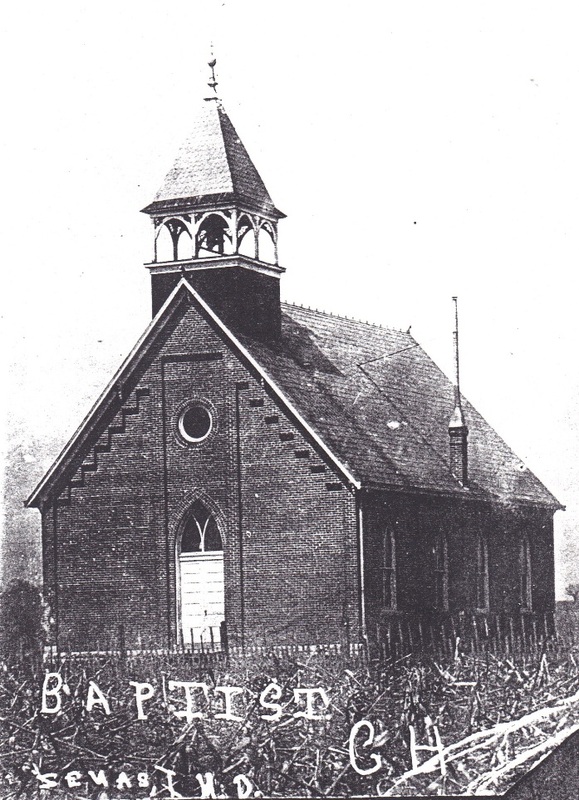 The Baptist Church at Zenas, Jennings County, Indiana, was constituted June 20, 1843, by a council of brethern from the following sister churches, vis. : Rock Creek, Zoar, Concord, Hopewell, Brush Creek, Vernon and Marion--constituted of the following names, vis. : John P. Patterson, David Smiley, John Green, E. and Sarah Glasgow, Louisa Elliott, Rebecca Smiley, Letta A. Elliott, Sarah Green, Mary R. Patterson, and Margaret Hibbard. These few took upon themselves the solemn vows of Church Covenant, to worship God and maintain and honor the cayse of Christ in the community where they lived. Of this constitution all have passed away but Sister Hibbard (now Sister Elliott) who still lives a blessing to the Church and community around her. The first meeting for business was held in a school house in Zenas, July 17, A.D., 1843 Elder Andrew Baker was chosen Moderator, and Ephrain Glasgow, Clerk. The Church during its existence has had eleven pastors, vis. : Elders Baker, Tucker, Christie, Sneed, Reynolds, Swincher, Stott, Waters, Johnson, Spear, and Allee. Elders Baker, Tucker, and Christie's pastorate continued for about ten years; E. Sneed, two years; R. Kelly, two years; J. Reynolds, two years; J.B. Swincher, four years; J. Stott, three years; J. Waters, two years; N. Johnson, four yearss--who is our present pastor. The Church has had four deacons, vis. : John Raffety, David Mavety, Randolph Daughters, and William Galloway; the two last our present deacons. The Church has had six clerks, vis. : Ephraim Glasgow, James Huckstep, William Hall, David Burton, Franklin Hittle, and Nathan Gloyd, present clerk. The Church has lost many of its best members by death and immigration in the last few years; but there are a few yet who wish to maintain the public worship of God and contend earnestly for the faith once delivered to the Saints, and as a Church it feels that it has some influence from the fact that many of its best citizens are its friends and ready to help it in time of need. There have been attached to the Church since its existence two-hundred and twenty members-the present number being sisty-three. As for discrepancies in dates between the Hopewell account and that of the above history, no reason is known, except the human capacity for fallability. At any rate, we may safely state the constitution of Zenas Baptist church in the Summer of 1843. As for the first building, little is known. A history of the Church written in 1972 indicates the first building was a log cabin "according to an Atlas of 1884." This could very well be correct. At any rate, this building was vacated in 1900 for the present site. According to Mabel Allee, the wood from that old church was thereupon used to build her house, the house where Shirley Jackson used to live, and a house on the old airport long since destroyed, or removed. The wood was Elm. One of her ancestors, Alfred Taylor, played the organ in that church on occasion though he, himself, was a member of Rockcreek Church. As for more early history, we are dependent on the minutes of the Sandcreek Association. Zenas was one of the churches to attend the meeting of Sandcreek Associations's formation on Christmas Day, 1844. John Green, David Smyley, Azeriah Draper, and Ephraim Glasgow, were Zenas' messengers. According to the Centennial edition of the Sandcreek minutes, Zenas joined the Association in 1845. Fortunately, it is from these minutes that we learn of at least one very inportant and influential churchman from Zenas by the name of John Raffety. One of Zenas' first deacons, he wrote the "Circular Letter" for the Association on three occasions. The Circular Letter was the letter written on behalf of the Association to all its member churches, and the author was appointed by the Association. In addition to this, Raffety served several times on the Executive Committee of the Association whose task was to acquire ministers to preach the Gospel to those "destitute portions" of Sandcreek Association. The other messengers often chosen to attend the Association were David Mavety, Azeriah Draper, and Julius Underwood who came to Zenas via Hopewell. These others often helped in writing of "Correspondence Letters," lwtters written by appointed members of the Association to sister Associations. As for numbers in those early days, the Sandcreek minutes report Zenas as having 23 members in 1845. By 1855, this number had doubled to 46. The way of recieving members was much like it is now with some members received by "relation". Dismissals were as they are now with many churches often "excluding" or "erasing" members for various reasons, presumably for absenteeism or unbecoming behavior. Zenas exercised this methos of dismissal yearly, thus indicating some degree of chruch discipline. Fortunately, in those Sandcreek minutes, there are years in which "Church Digests" are recorded. This "Digest" was created from taking the various church letters and giving a summary of them. The following was taken for Zenas in 1865: "Ask the brethern to pray God to visit them as in former days. Asks God to bless the deliberations of the association. Have the labors of Elder John Stott as their pastor monthly." (One will notice that Elder Stott is said to have served monthly. This is because in the early days, Zenas was but a quarter-- time church and was so even after the turn of the century.) Again in 1866: "Enjoys peace among themselves; have the labors of Elder John Stott who has labored faithfully in counselling and warning, yet it seems that the church enjoys little of the incomes of grace; asks the prayers of the Association that they may live more faithfully." In 1872, the rather brief statement is given: "Still exist as a church. Enjoy the blessing of God's favor." Again in 1883, the somewhat downhearted digest is given: "Still lives as an organization, though doing but little work for the Master." Evidently, things at Zenas were somewhat dry as she requested the following year for the Association to "send one or more ministers to labor with them." Thereupon, a special committee was created by the Association to "see what could be done to assist the weak places." Unfortunately, nothing more is said concerning the outcome of this committee's work. On the bright side, Zenas is rightly commended for being one of the first in the Association having a "Sabbath School," as recorded in the Sandcreek minutes of 1884 and verified in by the minutes of 1849. Zenas Church also maintained a library early on of about one-hundred volumes. They were among the early pioneer preachers of Sandcreek Association, and their whole lives had been spent within its bounds. Owing to the infirmities of age neither of them had been actively engaged in the ministry for a number of years. Their testimony was, however, to the goodness of God and through many trials and much suffering it can be said of both Brother Waters and Allee, "He was faithful unto death." Another obituary of Reverand Allee was given, courtesy of Edna Cruser, and describes graphically the plight of the early pioneer preacher. It speaks of travelling far and near, sometimes over roads, sometimes throug brush, trees being blazed along the path. The pioneer preacher might also cross high creeks with horse. Reverend Alle is said to have carried Bible, hymn book, and a suit of clothes, in his leather saddle bag. He often heard the lonely woodman's ax in the distance, or even the threatening howl of wolves. Such was the life of the minister who would preach God's word in those early days and make his surroundings his mission field. For an even sweeter obituary of another member of Zenas, we find written in the Sandcreek minutes of 1890 the following of Sister Lilly Bowers who died at the age of only twenty-three: "Sister Bowers was taken sick after her acceptance for baptism, and never was baptized. She died regretting only that she had been unable to obey in the lettter as well as the spirit." To bring us up to the twentieth century, the church purchased the property of its present site in September of 1900 for the sum of one-hundred dollars from William and Elizabeth Galloway, William having been a deacon of the church. The former property was sold to Almira Clements for one-hundred and fifty dollars in March 1901 (these are both recorded at Jennings County Courthouse.) The Banner Plain Dealer of September 22, 1900, states: "A goodly crowd attended the ceremony of laying cornerstone of the Baptist Church on last Thursday. The Sunday School picnic on Moor's Grove, a mile west of Zenas on the 13th inst. was a fair success." As for Zenas school, the following was written in the same article: "The new graded school building is nearing completion. It promises to be one of the nicest school buildings in the county and architecturally beautiful to be an ornament even to Zenas." And in the March 1901, edition of the same newspaper: "The new Baptist Church is slowly, very slowly, nearing completion." This is an early history of Zenas Baptist Church based upon sparse information. May it somehow be a means of edification, regardless of its many shortcomings incurred from both sources and writer, to those who would hear it. Jesse Farris 1917-1918 Jim Rice ?